When we oh-so-innocently adopted Quinn a few months ago, we didn’t realize that we were adopting Joseph Stalin reincarnated in dog form. Don’t be fooled by the cute face and ridiculously adorable waddle, he rules this house with an iron paw and uses terror to keep his subjects in line. First of all, he’s just not very good at dogging. He doesn’t play with toys and he acts like going outside is some kind of brutal punishment suitable only for the other two peons he lives with. He just can’t figure out how he ended up in a place with two such common canines, but it only took him a matter of days to terrify them enough to move to the top of the pecking order. His favorite activities to partake in with his “brother and sister” (which he finds terribly insulting) are: barking at them, chasing them, trying to steal food from them, and snarling at them if they come anywhere near him when he’s chosen to have People Time. 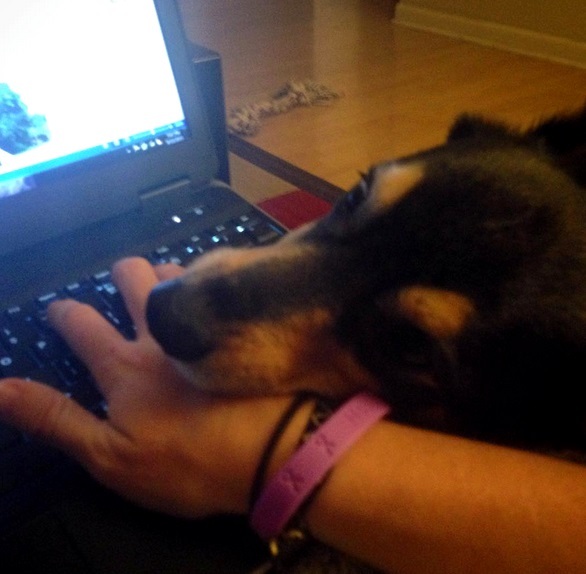 That’s right – he chooses when he wants affection. If you pet him when he doesn’t want to be petted he glares at you as if he’s contemplating having you hauled off to a military prison and tortured. But when he does want affection, he wants it NOW and he wants it on his terms. If that means he has to put his fat little stumper feet all over your laptop, freezing and crashing every program you had open… well, that’s the price you pay for the privilege of his company. Our other two dogs don’t sleep on the bed. When Rob and I were each single, both of our dogs slept on our respective beds. Since Rob and I have been together, both of dogs have been relegated to their own beds. Fair is fair, after all. Or at least fair WAS fair, until Quinn came along. Guess who sleeps on the bed? Not just sleeps on the bed, but gets lifted onto the bed every night at bed time, because if you’ve ever seen a corgi try to jump then you know how little lift those stumpers generate. Quinn waddles into the bedroom, looks at you with that penetrating corgi stare, and says “Hey, human-servant! Raise me onto thyne throne!”. And we do. Because dammit, he’s just so cute. Plus if we didn’t, he’d probably have us killed in our sleep or something. You’d think that things like this would buy us some loyalty from Quinn Stalin, but no. He has tried to leave with not just one but TWO delivery guys. He made it all the way to the pizza guy’s car before we snagged him, and the poor Chinese food delivery guy looked appropriately terrified when he realized he was being chased (at a slow trot) by a perpetually hungry corgi. It’s obvious that Quinn lives for food. Any time you walk into the Magical Food Room he’s right on your heels, usually completely in your way and standing in front of whatever you’re trying to access. I have never seen a dog actually try to climb into the refrigerator before. Just make sure before you leave the kitchen that you know where Quinn is… that one time he accidentally got shut into the pantry really pissed him off. We were all walking on eggshells for days worried about retaliation, but luckily the treat I gave him upon release seemed to soothe the beast. Quinn being deaf has added a little bit of complexity to having him around, but not a whole lot in the grand scheme of things. Mostly because even if he could hear, I’m pretty sure he’d ignore us just as much. The only difference is we have to wave our arms to get his attention instead of just saying his name, so that he can then flip us the bird and do whatever the hell he wants anyway. The thing you hear most often about corgis is how much they shed. People aren’t kidding, Quinn leaves a trail of hair behind him wherever he goes, regardless of how much we bathe and brush him. I find Quinn hair in all kinds of places… my underwear, my purse, all over my car, in between the keys of my laptop, and I even found a Quinn hair on Henry’s bridle. Let’s not even talk about how much of it I eat on a regular basis. I’ve given up trying to keep the dog hair out of the food and off of the dishes… it’s like velcro. I’m pretty sure he climbs into the cabinets while we’re gone and has a good shake, laughing maniacally all the while. But after the first few weeks you become blind to the tumbleweeds of dog hair that are forever blowing across the living room. Basically, life with a corgi is a lot different than life with our other two mutts. I’ll tell you a secret though – and please don’t tell Quinn because he’ll see it as a sign of weakness and surely have me offed – we absolutely adore him and wouldn’t change a thing. I’ve always wanted a corgi, but now you have me scared!!! Meh, it’s just hair. Totally worth it. Poor Rob, he has to live in a house with a corgi, a GSD mix, a JRT mix, and me. I’m not sure who sheds the most, out of the 4 of us. 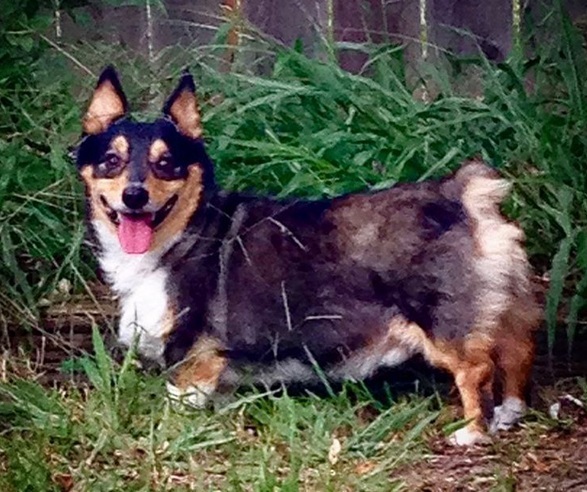 He does look like a fierce corgi version of Ben Stiller. Hear you loud and clear on the fur – our Anatolian mix leaves a trail of fur wherever he goes. I had no idea fur could get into the places it does – and the tumbleweeds never EVER end! I suspect when you decided to adopt him it was really his idea. Like you got a telepathic inception wave he was ready, come get me. Probably. I wouldn’t put it past him. Um, I hate to break it to you, but I think you adopted a cat. I can totally relate to almost all of this, except I have yet to find corgi hair in my underwear or on a bridle. But you will NEVER get it out of your car. If hel’ll tolerate it, you may try body clipping him. Rusty loves it and lets me do it myself. He looks like a sheared sheep afterwards, but it does stop the shedding and he enjoys the cool breeze he gets afterwards. Corgi hair is murder on cliper blades though and you will need to get them sharpened after two shaves. He was clipped when we got him because his skin was so funky from the shelter. It made him so spiky though! What a squish. I just want to squeeze his little dictatorial self. He’s a lucky guy to have y’all! Super cute. Quinn Stalin! What a name. what a lucky little dude!! Quinn is so cute! I love the glaring. OMG the faces in those photos are all just too adorable! He and Thule share many qualities. She too only cuddles on her terms and then it is very aggressively. She also demands to be lifted on to the bed at night and then gets quite offended and leaves when we climb in after her. And the hair. Everywhere. We think she actively put it back after we vacuum each week. What a cute little chief you got there.